A boxer knows he is going to get hit. He may learn how to take the hits and minimize the damage. But he knows that if he is going to fight, he is going to get hit. Does that prevent him from stepping into the ring? The pain of getting hit should be a powerful lesson. We learn from pain. There is a repeated lesson in Proverbs concerning the wise and the foolish. The wise listen. They take in knowledge. Fools, however, don’t shut up. They keep talking. They don’t learn. Nobody begins with wisdom. We have to learn it. As children, we should be corrected for our foolish words and acts. The correction should be strong enough that we learn and do not repeat the error. This should be a continuous process until we become refined adults able to function society. This is what should happen. But often, the correction never comes or is not severe enough to deter the child from this foolish behavior. Discipline is not a bad thing. You put a hand in the fire. You get burned. You know in the future to not do it again. You say something offensive among your peers. You get called out or ignored. In the future, you will either curb your tongue and provide something meaningful or you find a new group. You find what works and what doesn’t. You take your lumps and you grow. The rod of correction. Sounds horrible, mean, and abusive. In the old days, fools got whipped. Why? What is the reasoning? To get better. To learn. If you knew you were going to get whipped for foolishness, wouldn’t you stop being foolish? Wouldn’t it be better to take the correction and learn? We all get the rod of correction sometimes in our life. Whether it is physical or psychological, from our parents or from society, we cannot escape it. It is up to us to learn. It is up to us to test the waters, get in the ring, and try our best not to get punched in the face. 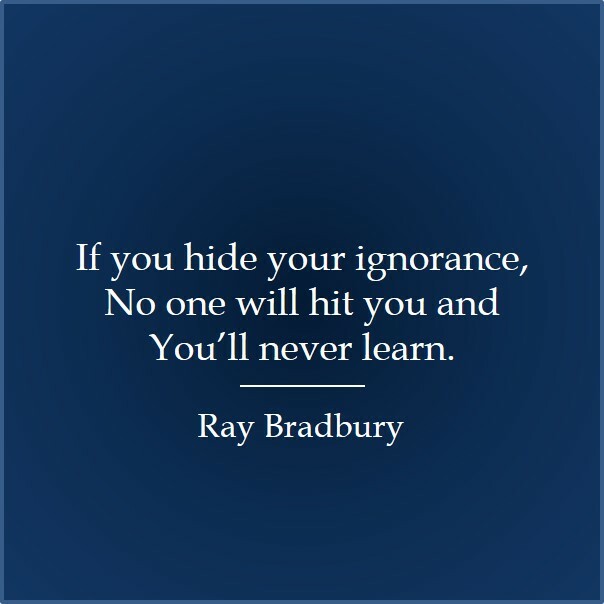 It is okay to be ignorant. It is not okay to stay ignorant.